Albuquerque, NM is a beautiful city located in the central part of New Mexico. Its climate is semi-arid, but it is not unusual to have hot summers, as well as very cold winters. Fortunately, winters are typically short, but even spring can bring chilly, windy weather and keeping your home warm is important. Homeowners throughout the Albuquerque, NM area know that a reliable HVAC system is an essential element in keeping their homes a comfortable temperature, especially given the widely varying temperatures this area experiences. Of course, in addition to quality HVAC equipment, a reputable air conditioner contractor is needed to keep your heating in cooling equipment in top operating condition. An experienced HVAC contractor like Aztec Mechanical is a crucial component in maintaining a comfortable indoor environment. From quality products to the very best in heating service, we strive to ensure the very best service possible. 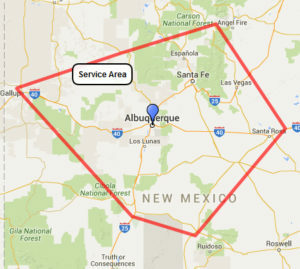 We are a locally owned company and take pride in having served homeowners throughout the Albuquerque, NM area since 1977. At Aztec Mechanical, we offer a complete line of HVAC services. As a leading AC contractor in Albuquerque, NM, we know how important providing reliable air conditioning service is to our customers. Whether you are interested in purchasing a new air conditioner, heat pump or furnace and need professional air conditioning installation or you want to discuss the benefits of an air filtration system for your home, you can be sure that our trained technicians have the expertise to provide you with the very best service possible. Homeowners in Albuquerque, NM know that without a leading HVAC contractor to maintain and service their heating and cooling systems, they will eventually be faced with equipment failure. At Aztec Mechanical we offer comprehensive maintenance agreements designed to protect your equipment. In fact, whether you need routine air conditioning service or you are experiencing cooling problems and need emergency air conditioner repair, our trained service technicians have the expertise to get the job done quickly and accurately. Of course, as a leading HVAC contractor, we offer much than just quality air conditioner installation or AC repair service, our service technicians take pride in providing the very best in heating installation and service. Whether you need air conditioning repair, heating repair such as furnace repair, or other HVAC services, Aztec Mechanical will strive to ensure complete customer satisfaction. A Mechanical Contractor is Ready to Help You! In addition to providing quality heating and AC service, at Aztec Mechanical we also offer professional plumbing and engineering services. When you need a professional contractor for the designing or building of your project or you need HVAC or plumbing repairs, Aztec Mechanical is your quality solution in Albuquerque, NM. 24-hour service available.Give us a call today and find out how our expert team can help you with all of your home comfort needs.